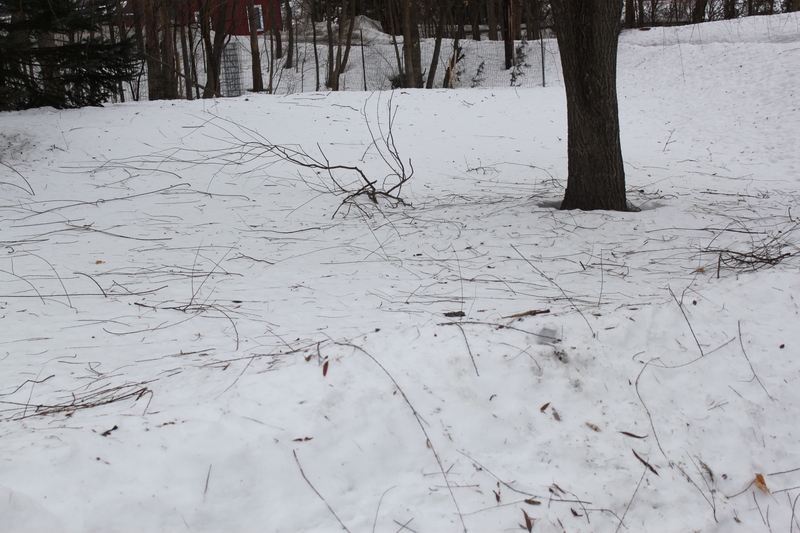 Last night, our very welcomed February thaw ended with tremendous gusts of wind that rattled my house in St. Albans, Vermont and howled through the trees outside. With a full moon dashing in and out of clouds racing across the sky, the combination would have been perfect for a horror movie. The mess under my willow tree this morning. 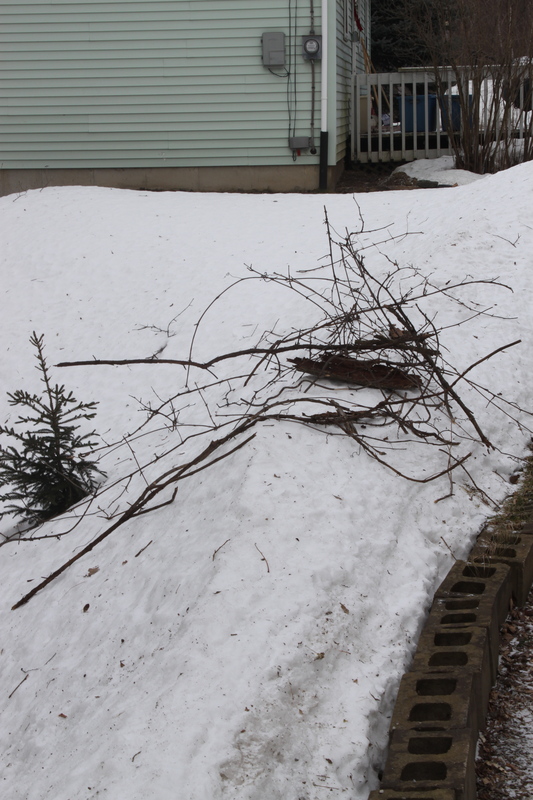 About half the branches and twigs came down earlier this winter, the other half blew down last night. When dawn broke this morning, there was no horror outside, but quite a few fallen branches on the lawn and driveway that weren’t there last evening. It’s messy looking, but the broken branches are a good thing. Some of them were dead, ugly limbs that had been clinging stubbornly to my otherwise robust weeping willow tree, and had been taking a bit away from the willow’s splendor. Others branches were parts of dead trees that are located too close to the house, or power lines for me to safety chop down. So it’s a welcome sight to see those dead hulks slowly disintegrate. A tangle of branches and grapevine that blew off the trees last night and onto my driveway. I just threw them aside onto a snowbank for now. Still other branches were parts of extensive, tangled grapevines that were clinging to the trees. Last March, I cut huge grapevines at their base. They were bigger than the circumference of my wrist. I couldn’t tug all of interlocking mess of grapevine from all of the trees, so there they hang, looking ugly as hell. Now they’re starting to slough off the trees, and that’s a great thing. I won’t mind at all picking up the mess of branches. The wind died down early this morning, but picked up again this afternoon. Maybe some more ugliness in the trees will fall, eventually leaving me with a lush green, healthy looking collection of trees this summer. This entry was posted on February 19, 2011 at 7:01 pm and is filed under Uncategorized. You can follow any responses to this entry through the RSS 2.0 feed. You can leave a response, or trackback from your own site.